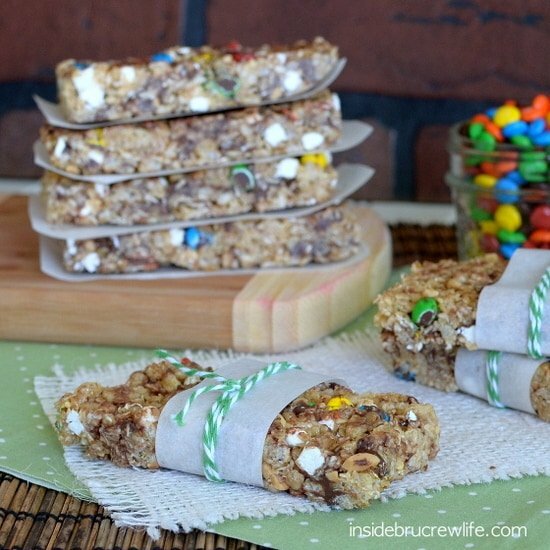 Time for another fun round of the Secret Recipe Club with these easy No Bake M&M Granola Bars. It is a group of bloggers that get together and make a recipe from their assigned blog each month! Basically we are encouraged to blog stalk until we find the “perfect” recipe! This month I was given The Fearless Homemaker!!! oh and keeping up with her on facebook and instagram too! and to get to know her even more!!! things like Oatmeal Chocolate Chip Cookie Muffins (those are most definitely going to happen soon too) look at theses Pumpkin Cupcakes with Salted Caramel Buttercream (love me some pumpkin and salted caramel), and oh me, oh my S’mores Cheesecake with Toasted Marshmallow Topping (I die). I seriously wasn’t sure how I was going to pick just one recipe to make this month. the No Bake Granola Bars won out. and after a day at the pool I was feeling kind of lazy like! I have been feeding them. I’m not sure if I will ever buy another box from the store again!!! These were so delicious and fresh! for new varieties!!! So many things you could do with this recipe. Love me my pb cups!!! not much you can change up except your mix-ins. That I had fun digging through my cupboard for goodies. mini marshmallow bits, and chopped peanuts!!! Why yes, I do love all things mini! with lots more fun flavor combo’s! Thank you Amy for so many great recipes and a fun blog to read!!! You are the bomb girl! 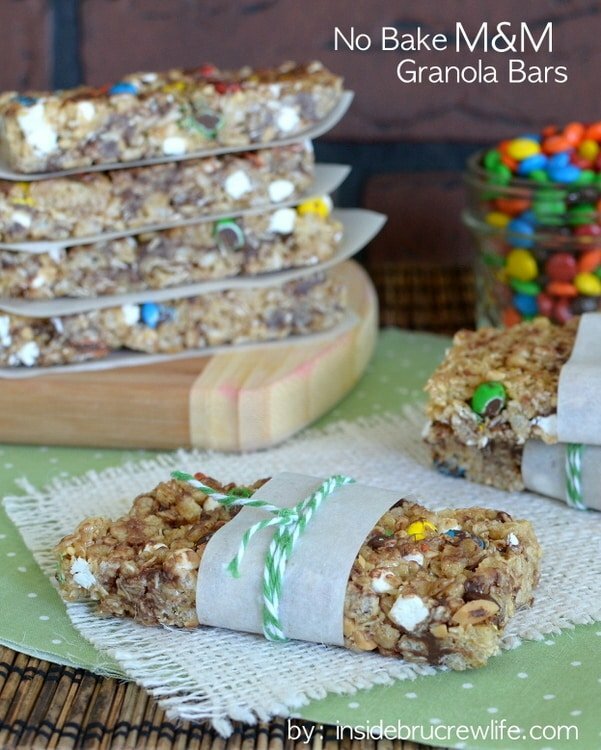 No bake granola bars are a fun way to enjoy a snack in the afternoon. Have fun with the mix ins and create your own fun flavor. Combine the oats and cereal and set aside. In a large saucepan, combine the butter, brown sugar and honey. Stir over medium heat until melted and the mixture begins to bubble. Reduce heat and cook for 2 minutes. Stir in the vanilla. Add the oats mixture and stir until coated. Let cool for a few minutes before stirring in all the mix ins. Press into a greased 9x13 pan. Make sure you really press it down so everything sticks together. Let cool on the counter for about 2 hours before cutting into 24 bars. Store in a tightly sealed container. yum! 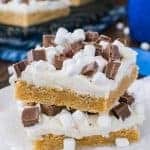 no bake granola bars with a s’mores taste and laoded with m&ms. Girl, this has my name written all over it! perfect for my summer hikes! What a fun granola bar! 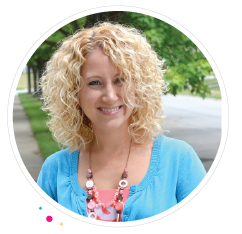 I love Amy’s blog…. will have to try these as well. 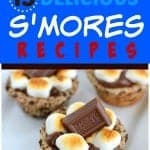 S’mores cheesecake?! I die too! Gave you a stumble and a pin – happy reveal day! Looks delish to me girl. LOVE making granola bars! 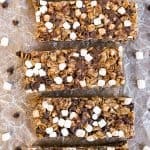 I’ve always wanted to try homemade granola bars — these look perfect! You definitely need to try them…I couldn’t believe how easy they were to do! I loved going through your blog! You have so much fun stuff! Thanks for the sweet comments on your own creation:-) I am so thrilled to have found you through SRC!!! That’s what makes these granola bars so cool…you can totally add whatever you have in your cupboards and they will still be great!!! I hope you like making them!!! These look delish! I’ve bookmarked a few of Amys recipe too. I want to make so many of Amy’s recipes too:-) She has some of the best things!!! Jocelyn the way you set up your food and photograph it is just gorgeous! I am always so impressed with your pic’s 🙂 I am also impressed with the looks of these granola bars. Yummieeeeee!! These look SO yum. I keep saying I need to make granola bars but I never do. Now I really need to! 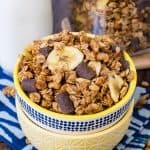 I love homemade granola bars and no bake ones are even better. 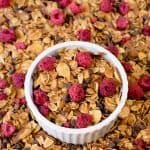 I’ve made granola bars similar to these before….yours look great! Great SRC pick! No bake sounds great for this week – it’s supposed to be 100 in Chicago on Thursday! We are close enough to Chicago that I think we are getting that weather on Thursday too! It will be a pool day for sure!!! Yum! These remind me of kudos bars– which I HEART! 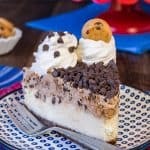 No bake – and M&M’s – love this for summer or anytime! 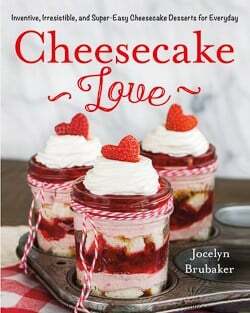 Jocelyn, I’m so excited to try this recipe! Sharing on Facebook and pinned it too! Where does the brown sugar come in? Whoops! Sorry about that…you will add it with the honey.